Astoria Blue Feather Early Learning Center (ABF) is a barrier-free school located in Astoria, Queens, which has provided high-quality services to children and their families for over twenty years. ABF accepts children ages 3 to 5 years of age who have developmental delays such as autism spectrum disorder, Intellectual Disabilities, Communication Disorders, Down Syndrome and Orthopedic needs. We educate our children in classrooms of 12:1:2 and 8:1:2; ensuring a high teacher to student ratio in each instructional setting. We understand that children learn best when content is presented in various modalities, including a dominant/preferred language so ABF has teachers and therapists who can provide bilingual instruction in Spanish. Our bilingual staff is eager to assist families in grasping the sometimes complex issues surrounding their child’s diagnosis, preschool education and future decisions regarding their child’s academic needs. The staff at ABF Early Learning Center implements developmentally appropriate practices to work with and stimulate each child depending on their learning needs. Technology, such as computers, iPads, and the Smart Board, is utilized in the classroom environments as well. ABF Early Learning Center provides a variety of opportunities for parents to become partners with our program by visiting the school, by attending: free workshops, parent training, and parent support groups, by participating in their child’s therapy session, team meetings, Parent and Teacher Conferences, school trips, and school events. Instruction at ABF Early Learning Center is provided by licensed and experienced Special Education teachers who understand child development and who value and respect diversity. In addition, teacher assistants also hold New York State certification and participate in many Professional Development experiences. These trainings help TAs more effectively support the Special Education teacher in fostering a nurturing, supportive and language-enriched learning classroom environment. The school also benefits from other support and administrative staff. This includes certified and licensed clinicians in Nursing, Speech and Language Pathology, Occupational and Physical Therapy, and School Psychology. The school is led by a Program Coordinator who possesses a School Building Leader Certificate and a Principal who holds both a School Administration and Supervision and School District Administrator Certificate. Curriculum decisions are supported by the Education Trainer Director for Preschools. Astoria Blue Feather ELC utilizes The Creative Curriculum for Preschools which focuses on child development, learning environments, content areas, defining the teacher role and recognizing the family role, in conjunction with Teaching Strategies Gold Online Assessment System. Along with the established “interest areas” in the classroom (block area, dramatic play area, art, etc. 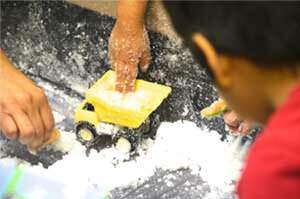 ), the Creative Curriculum supports social, emotional, physical, cognitive, and language development. The Creative Curriculum emphasizes small group instruction and rotations in order to provide the most effective, accessible instruction. Teaching Strategies Gold Online Assessment System is an authentic, observation-based Assessment tool designed to assess development and learning of children from birth through kindergarten and it is aligned with the New York State Early Learning Framework and with early learning standards in every state. This Assessment tool has granted our program the opportunity to measure student progress and ensure that the students are meeting New York State learning standards. Along with measuring student growth, this tool has provided our program with a systemic approach in aggregating, analyzing and disseminating data to our classroom teachers and staff as well as to our families. In addition to using the Creative Curriculum for Preschool, ABF Early Learning Center continues to utilize supplemental curricula and programs such as Handwriting without Tears and the STERN Math program. Handwriting without Tears is designed to encompass foundation skills for successful learning by providing an optimal learning experience in the areas of playing and singing, motor development, social/emotional, cognitive/language, sensory and visual perceptual skills. The Stern Math program is a comprehensive program for teaching the foundation of mathematics and number sense for children from Pre-K to fourth grade. Children experiment with colorful wooden blocks that fit into boxes and grooves. The approach is based on reasoning and insight into mathematical relationships, not on rote learning and counting. This organization of the math program is clear and logically developed through a systematic plan of experimentation, practice, and review that leads children from simple number concepts to a mastery of computation and problem-solving. 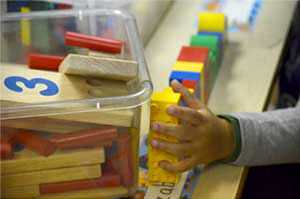 Children emerge from this program with competence and confidence in their mathematical ability and with a love of math. Literacy is an integral part of ABF Early Learning Center. Our program coordinates with Scholastic Book Company to participate in yearly book fairs. This helps not only cultivate the children’s interest in books but also encourages family’s to establish a routine with their children that make reading a part of their daily schedule. Providing our families with trainings on language and literacy, reading, Handwriting without Tears, the Creative Curriculum, and more, allows parents to expand their parenting skills and encourages parents to carry over in the home. In order to foster good eating habits early on in life, the staff at ABF Early Learning Center promote healthy eating. Families are encouraged to provide a healthy and nutritious lunch and snack for their child on a daily and consistent basis. Cooking projects which also incorporate language and literacy are provided to the children by our classroom staff. To increase the awareness of our students in the area of the community, students are able to participate in community walks and educational field trips. In addition, parents are invited to the classrooms to discuss their job within the community- restaurant workers, chefs, EMS workers, police officers, and others to also bring awareness of the various roles that “community helpers” play. For all the supports available at Astoria Blue Feather Early Learning Center combined with nurturing, dedicated and professional staff, families can feel confident in entrusting their most prized possessions to us.